November 22nd in Premium Themes, Themes For Video Bloggers by Wordpress Jedi . I had a story about WP.Element’s Jason moving on to doing bigger and better things. Jason’s new theme shows that he hasn’t been wasting anytime developing new themes. 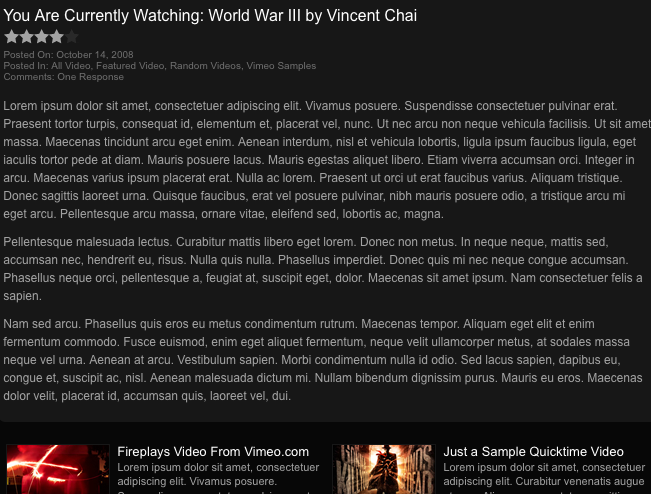 His RevolutionTV theme is arguably the best video-blogging theme I have seen. The theme is well-designed but would be most likely useful only to super video-bloggers (someone like the star of Ask the Ninja). You can get the Revolution TV theme for free on Revolution 2, but I strongly recommend signing up for their Pro program. Not only you get support for all their themes with their pro program, but they also provide you with help on how to customize these themes. It sure as heck beats paying $1000s to create a custom theme made from scratch. Ratings: 5/5. The theme is perfect even based on my picky standards. Vloggers rejoice.